Dog arthritis medications, if used carefully and strategically, can bring relief of joint pain and discomfort to our old dogs. This is Part 5 of my “Ultimate Dog Parents’ Guide to Arthritis in Old Dogs”. 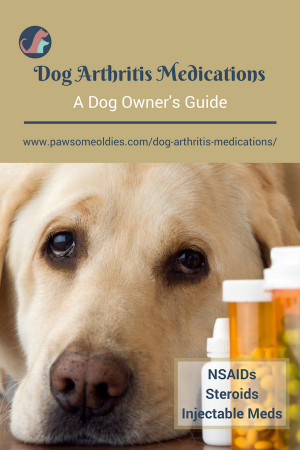 In this post, we are going to look at some prescription dog arthritis medications (such as NSAIDs) that are used to manage pain and treat arthritis in dogs. There are several classes of medicines that can be used to treat dog arthritis, but perhaps the most commonly prescribed class is NSAIDs. NSAIDs stands for non-steroidal anti-inflammatory drugs. This class of medications is known for reducing pain, inflammation, and fever. They work by slowing the production of chemicals in the body called prostaglandins, which cause pain and joint damage. Prostaglandins irritate joint surfaces, causing the joints to deteriorate and stimulates the nerve endings. Although many vets prescribe NSAIDs for dog joint pain and arthritis, and reassure dog parents that these drugs are very safe, NSAIDs (like all drugs) can cause some side effects in dogs. The most common side effect is tummy problems, such as diarrhea, vomiting, appetite loss, bloody stools, ulcers, constipation. In some dogs, NSAIDs can cause kidney or liver damage, although it is rather rare. NSAIDs have not been tested on pregnant dogs, so do not use these drugs on pregnant or lactating dogs. Do not use NSAIDs in combination with steroids and other NSAIDs. Wait at least 72 hours between the last dose of the old NSAID and the first dose of a new NSAID or other drugs. Do not use NSAIDs in combination with herbs that may cause ulceration or bleeding, such as white willow bark. Always tell your vet about the type of NSAID you are giving your dog. Do not use NSAIDs designed for human use on dogs. Since NSAIDs may cause liver or kidney diseases, and many old dogs may have liver or kidney problems, be sure to work with your vet so he can choose a medication that will not aggravate these problems. Also, ask your vet to have blood tests done before starting your dog on any NSAID and again 2 to 4 weeks after starting, to ensure that the drug doesn’t affect the liver/kidneys adversely. Thereafter, blood tests should be done every 3 to 6 months to monitor liver/kidney condition. Always start an NSAID at the lowest possible dosage. Use NSAIDs as needed to relieve pain (short-term, infrequent use). For example, just give your dog one or two doses of an NSAID when your dog shows signs of pain occasionally. Use NSAIDs as needed to prevent pain (short-term, infrequent use). For example, you and your oldie are planning on a weekend hike. To prevent joint pain after the hike, you may choose to give a dose of NSAID before and after the hike. The third way is to use NSAIDs to treat a short-term cause of pain (short term, steady use). For example, use an NSAID to reduce pain after surgery. Lastly, use NSAIDs to treat chronic pain (long term, steady use). For example, use an NSAID to treat chronic pain caused by arthritis, or cancer. There are quite a few NSAIDs on the market, how can you choose a suitable one for your dog? Previous successful use – If you have used an NSAID with good results in the past, it makes sense to use it again, doesn’t it? Side effects – Again, if an NSAID has caused side effects to your dog before, it makes sense to avoid that one! Recommendation by your vet – If your dog has never used an NSAID before, it may be a good idea to ask your vet for some recommendations. Once you and your vet have picked out an NSAID, you can try it on your dog for two to three weeks. During these weeks, keep a record of your dog’s activity level, pain level (better or worse or no change), any side effects, etc. I have made a printable for you to keep records. Download it here. If the NSAID seems to be working well, continue using it. You may want to visit your vet after 2 weeks to see if it is OK to reduce the dosage and/or frequency of the drug. If the NSAID is not good for your dog, don’t give up! Try another one (but remember to wait at least 72 hours before starting a new drug). Below you can find summarized information of FDA-approved NSAIDs for dogs. All precautions mentioned above apply to these NSAIDs and I have included drug-specific precautions below as well. Gastrointestinal upset, ulcers, liver/kidney damage (rare). Not recommended for dogs with known bleeding disorders (e.g. von Willebrand’s disease). Labrador Retrievers seem to be more commonly affected by Carprofen than other breeds. Relieving acute pain (e.g. after surgery). Should not be given to dogs with known diseases of the kidney, liver, or stomach. Should not be given to dogs who are dehydrated. Relieving pain; treating inflammation and stiffness. Gastrointestinal upset, ulcers, liver/kidney damage (rare), dry eye (rare). Should not be given to dogs with known diseases of the kidney, liver, stomach, or heart (e.g. congestive heart failure). Should not be given to dogs with asthma. Meloxicam stays in the body longer than other NSAIDs. If switching to another medication, wait at least one week after the last dose of Meloxicam. Gastrointestinal upset (vomiting, diarrhea, appetite loss) (rare). Grapiprant is safer and is recommended for dogs who cannot tolerate other NSAIDs. There are also a couple of injectable dog arthritis medications. You may have heard of Adequan®? It is an injectable polysulfated glycosaminoglycan (PSGAG). PSGAGs are found naturally in joint cartilage and Adequan seems to work in the same way as glucosamine and chondroitin. It seems to reduce inflammation and pain. The injected medicine reaches the joints within 2 hours of injection and remains in the joints for three days. So, injections have to be made two times a week for up to 4 weeks, with a maximum of 8 injections. Another injectable dog arthritis medicine is Hyaluronan, which is also found naturally in the joint. It acts as a lubricator and can be injected in the arthritic joint. The drawbacks of these injectable medications are costs and inconvenience. Another class of dog arthritis medications are steroids. As we all know, steroids are powerful drugs but come with a lot of nasty side effects. So using steroids long-term to treat arthritis in old dogs is not such a good idea. In fact, long-term use of steroids can add to the destruction of cartilage. The drugs can also weaken muscles and other soft tissues. 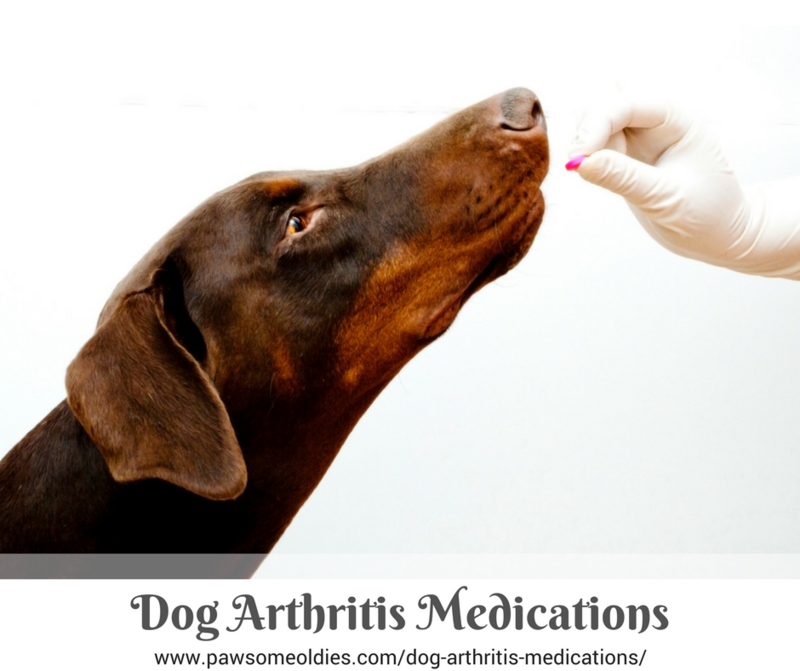 The only time steroids are used to treat arthritis is for the treatment of immune-mediated osteoarthritis in dogs, such as rheumatoid arthritis, and when the dog is very ill. The one class of dog arthritis medications that is relatively safe and can help reduce pain and inflammation is NSAIDs. They seem to be a good choice if your dog has the occasional pain. They can also be used in reduced dosage in conjunction with other treatment options (e.g. supplements, natural remedies, etc.) to make the dog more comfortable. Be sure to work with your vet to find one that works for your dog.